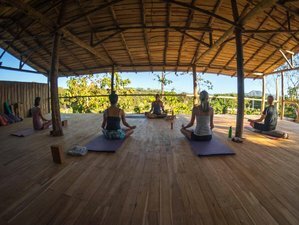 Expert tip: This is one of the most popular yoga retreats offered in Costa Rica. Revitalize and harmonize your mind, body, and soul in Guanacaste. Enjoy the warm weather and the beautiful views of the valley. The spectacular infinity pool is at the perfect temperature all year long and the restaurant serves some of the best food in all of Costa Rica including local and international vegetarian dishes. Relax by the pool, explore the surroundings or visit the four beautiful beaches that the lodge has only a few minutes drive away and spend a week to remember in Costa Rica. The spacious lodges are built from local teak and include queen size beds, air conditioning, and a large deck to relax in a rocking chair. The pool has a beautiful view of the valley and you can enjoy the bar that is right beside it. You can hear and see local species of animals on their natural environment and find peace and serenity in nature. This retreat includes daily yoga classes, alongside pranayama, meditation, and chakra balancing workshops that will get the energy flowing harmoniously. You will also enjoy the lovingly-prepared, delicious, gourmet vegetarian meals as well as diet and nutrition tips for living a healthy life. Other group activities will include hikes, music, dance, good vibes and great conversations. All within an accessible, non-competitive, non-judgmental environment that is appropriate for people of all ages and levels. This retreat is happening in Santa Cruz, Costa Rica. You will enjoy three gourmet vegetarian meals every day, prepared with great care and attention. From San Jose take the Pan American highway at route 1 west towards Liberia and after about 130 kilometers you will come to a small village called Limonal. Turn left at route 18 in Limonal heading towards Nicoya and stay on this road till it ends (49.3 kilometers) then make a right turn at route 21 towards Nicoya and then Santa Cruz (34.2 kilometers). Once you are at the second gas station in Santa Cruz hang a left at route 160 just past the small bridge towards Tamarindo. Follow the paved road to a small town called 27 de Abril (16 kilometers) where the paved road splits. Follow the right hand road which was recently paved towards Tamarindo. Take the road for about (6.4 kilometers) and the El Sabanero property will be on your left hand side on a hill on a small intersection with a bus station called Canafistula. Drive from the airport to the main road via the access road and turn right (1.6 kilometers). Go straight all the way at Highway 21 (47 kilometers) until you get to just before Santa Cruz. Follow the paved road to a small town called 27 de Abril (16 kilometers) where the paved road splits. Follow the right hand road, which was recently paved, towards Tamarindo. Take the road for about (6.4 kilometers) and the El Sabanero property will be on your left hand side on a hill on a small intersection with a bus station called Caa Fistula. Costa Rica has two airports which are San Jose International Airport (SJO) and Liberia Airport (LIR). Nearby bus stations to the lodge are Tamarindo or Santa Cruz. Please contact El-Sabanero Eco Lodge for more information. Airport: Daniel Oduber Quirós International Airport Airport transfer included: Daniel Oduber Quirós International Airport No additional charges. You can request this in the next step.